The farm was built in 1847 by Jacob Carel Jan baron van Heeckeren van Enghuizen. He was a military man in heart and soul who liked to name his farms after the military campaigns he undertook while serving in the French army - in this case a campaign to Moscow in 1812 under Napoleon. Moscowa has two chapels. The buildings have the typical pointed form. Entering one of the chapels, you will see towards the end of the walkway an unusual triangular stained glass window comprising some five thousand coloured pieces of glass. The windows, developed by graphic designer Jan P.C. van Doorn, evoke interaction. The pattern is of vegetation rising from the ground, dominated by horizontal and vertical lines. Moscowa opened a crematorium in 1974. 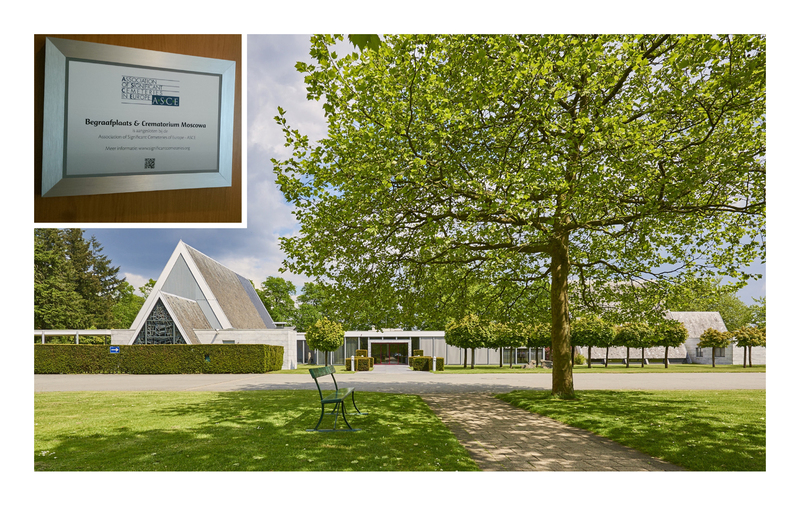 The site features a beautiful urn garden with a wide variety of memorials, many created by artists from Arnhem and the surrounding area. Ashes may also be interred in or on an existing grave. Moscowa currently covers over thirty hectares. The burial park which dates back more than 135 years is characterised by its lovely setting, monumental design and huge diversity of flora. The many unusual conifer trees are an especially striking feature. A wide variety of birds breed at Moscowa, including the Green Woodpecker, the Tawny Owl and the Buzzard, but songbirds are also well represented. In the autumn, there is a wide array of fungi, including the Cauliflower mushroom, Fly Agaric, Bay Bolete and Penny Bun or Porcino. This makes Moscowa not only a last resting place, but also a favourite with walkers. There are a multitude of historic and art-historic reasons to take a stroll around Moscowa. There are many very special monuments and tombs signed by artists and sculptors, in all kinds of different materials. Among the more striking in the collection are a truncated obelisk, an intricately embroidered pall over a coffin and an ornately sculpted neo-Gothic cross, but also a monument with great symbolism representing Faith, Hope and Charity, an Art Nouveau memorial and a mausoleum (the only one of its kind).